Mohd Adib Rosley couldn’t ask for a better way to end the season as he took his maiden CP130 victory in the final leg of the 2014 PETRONAS AAM Malaysian Cub Prix Championship at Taman Jubli Emas in Alor Setar, Kedah on Saturday. 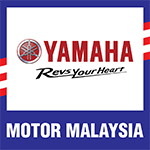 The Motul Yamaha YY Pang rider had an incredible race on board his Yamaha as a speedy take off combined with a menacing pace saw him quickly pull away from the pack and finish the race unchallenged in 15’13.239s. The only other rider who was close enough to stop him was Mohd Affendi Rosli but the PETRONAS Yamaha CKJ rider crashed at the final turn in lap-16, giving Ahmad Fazli Sham (PETRONAS Yamaha Maju Motor) the perfect opportunity to take second place 2.184 seconds behind Adib. Making things sweeter for YY Pang, Azhar Abdul Jalil outwitted Mohd Zamri Baba in the final lap to complete the podium steps with 15’21.553s. Newly crowned CP130 Champion, Mohd Zaqhwan Zaidi finished sixth after he collided with Ahmad Afif Amran (PETRONAS Yamaha CKJ) in the first lap. But not all was lost for the 19-year old as he and his teammate, Sasitharen Sukumaran who finished fifth successfully secured the CP130 Best Team Awards for Givi Honda Yuzy Racing. “No words can describe how happy I am right now. After two years I finally achieved my target,” said an emotional Adib. Hauling maximum points from this leg, Adib moves up to fifth overall with 108 points, while Zaqhwan ends the season with 171 points followed by Norizman Ismail (129 points), Ahmad Afif (120 points) and Fazli Sham 118 points. Meanwhile Kasma Daniel Kasmayuddin cast usual suspects into the shade and took his first CP115 victory ahead of newly crowned overall champion, Izzat Zaidi Salehan. 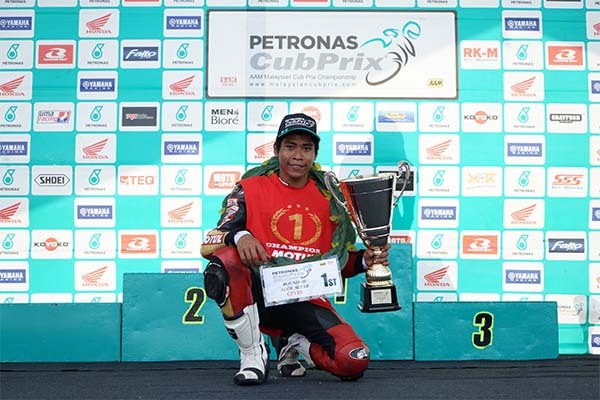 The PETRONAS Yamaha Maju Motor rider became the youngest rider to win an intermediate class race at the tender age of 14-years old when he wrapped up the 15-lap race in 12’56.793s. Izzat who started 14th on the grid following a poor qualifying outing yesterday put on an amazing display of talent to muscle his way to second place with 12’59.824s followed by Mohd Rozaiman Mohd Said third, 13’01.542s. Fairuz Nasir and Saiful Izman Ahmad Zamani ended Khairul Idham Pawi’s victory run as the Felda Pbafb Tech Racing duo secured a one two finish in the WIRA category. Fairuz capitalized on his front row start to lead the entire 12-lap race, taking the chequered flag in 10’30.143s while Saiful Izman came in as runner-up with 10’32.561s followed by PETRONAS Yamaha’s Azam Omar third, 10’39.539s. Khairul’s string of eight unbroken wins ended when he crashed in the third lap while battling the Felda duo. He recovered his bike and continued with the race but retired from the race after eight laps due to technical issues.